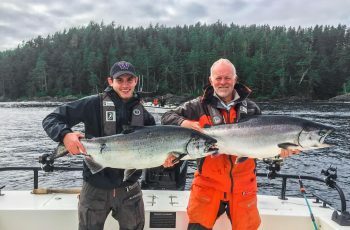 The fish are here, the August run of 22 to 28 lbers are here in numbers, with a few tyee in the mix, good times again at Langara! 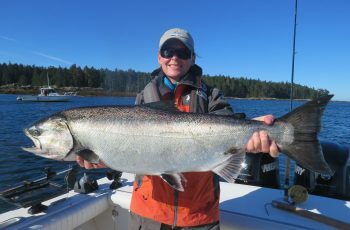 Today’s highlights included a 34 lb chinook for a Boeing guest, and heaps of 20 to 24 lbers. Cohoe Point deep was the ticket and all guided boats were on em. The tide was at 1pm and the fish were on the bite for three hours. Chinook at depths of 80 feet to 110 feet were hitting steady as were pocket coho, plenty of action. Flat calm seas again, zero wind and dry conditions, this is what August is all about at Langara. 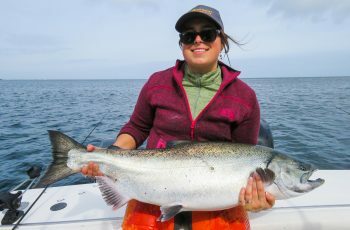 Our last trip was a good one as well, concluding on the 9th, one day we had 54 chinook between 20 and 44 lbs on the board. That is more like it. 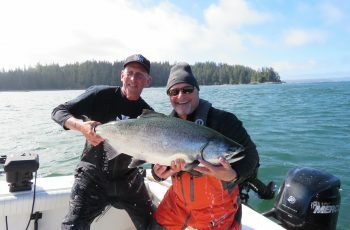 We had eight tyee, largest was a 44 for Stuart Watts, fishing on boat 23, and the fish was released. Runner up was a 42 lb chinook, angled by Martin Sanders. Mike Palmer had a 37lb fish, Steve Dow grabbed a 39 in Pillar Bay I believe self guided. 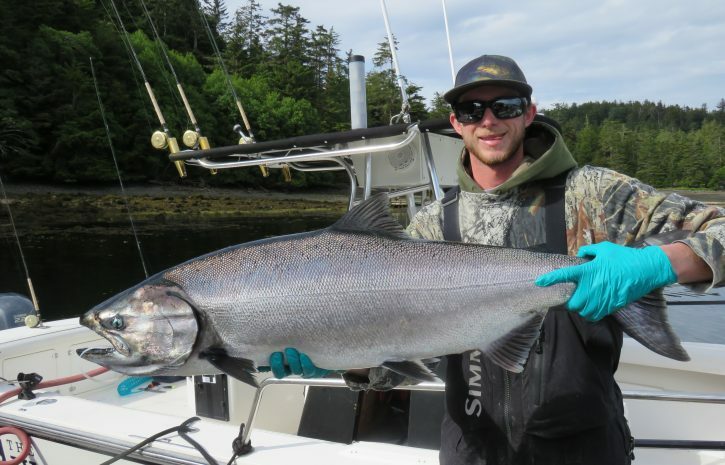 The 40 lbers were from Cohoe Point! 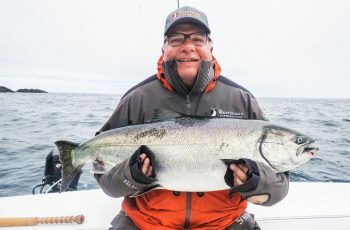 I was fishing with Niles Fulwyler, and his right hand man and aid Randy, and we had some good chinook fishing with lots of springs to 29 lbs, the Generals largest. Niles made me proud, he might be in his eighties now, but can still put the time in, fishing ten hours plus straight on the last day, out fishing time wise the whole lodge! I was groaning in a few of the thundershowers, not Niles though, spring after spring, he was angling up a storm. First time here for Randy, and he has it all together now, ready for his first tyee next visit. I hope to see you here again General! Say hi to Hank for me! So looks like our August fishery is on track, and did you notice no mention of sea lions? Yup, what the heck, have never figured it out yet why they smarten up in August, but thank you rock dogs. Thanks for #@%*# off and am glad to see you gone, this time you can deal with my stink eye!